Make sure you stay hydrated, but please don't bring glass. Bring your drink in a closed, plastic container to reduce spills and prevent shattered glass cutting students' feet. In my classes, stretching and core strengthening are a feature of the class that differentiates it from many other local classes. Although we have a quick cool down at the end and stretch periodicaly through class, we lay on the floor for stretching at the beginning. We also do pilates, yoga and core strengthening moves on the floor at the beginning of class. Many students like the extra padding of a yoga matt or towel and they like not resting their face against a floor that other people's feet have been walking across. No fancy costumes are required--though many returning students do find it fun to dress up and make costumes. And showing the belly isn't neccessary. The important thing is that you dress in loose, clothing so it is easy to move and that you feel comfortable in--mentally and physically. Many students like stretch pants, yoga pants or long, flowing skirts. Because we do stretches on the floor and are active with our floor work, it is best to wear something under those flowy skirts. 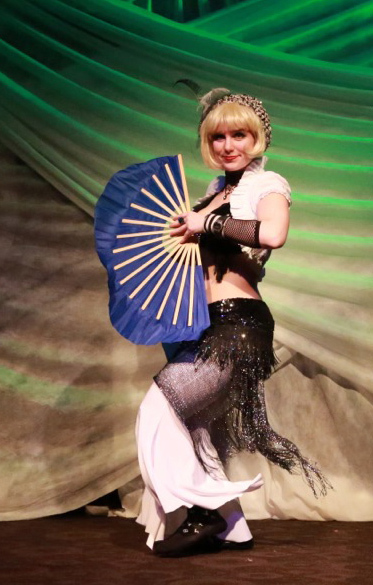 Belly dancers traditionally wear harem pants, though I have a fondness for vintage and Victorian fashion so I usually sport bloomers under skirts. If you are curious what this looks like, check out the images in the fashion section of the art gallery. To coin belt or not to coin belt? Wearing a coin belt, fringed hip scarf or tribal style belt to make noise when you shimmy is strictly optional. Many new students feel uncomfortable wearing a coin belt because it makes noise and they are afraid people will hear them if they make a mistake. When the music is playing and people are concentrating, no one listens to one coin belt. The purpose it to provide feedback for yourself so you are aware of your own movements. Plus, you feel like a real belly dancer when you can hear and feel those shimmies. I always keep one extra on hand for new students to try out. But again, it is strictly optional. Many belly dancers prefer bare feet, whether it is for spiritual reasons (a connection to the earth) or practical reasons (comfort). Ballet shoes, socks, barefeet or gym shoes if one has arch support problems are all welcome options. Be aware some studios only permit bare feet or ballet shoes, and socks might be slippery on smooth, wood floors. Some moves we do involve pivoting or shifting feet across the floor in such a way that it can be uncomfortable if one doesn't have dance shoes or socks. I always carry a back up with me for those occassions. Some dancers like to jot down the new moves they learned in class. If an instructor uses a whiteboard or puts up an easel with the names of the moves, it can be handy to take a photo of what you did in class. Some instructors permit videos, but please remember to ask before filming a teacher or other students. Some teachers teach with zills (finger cymbals), fans (one of my tribal fusion specialties), viels or swords. Usually you don't need to worry about these things in a beginning class. In a workshop, though, check the course description to see if the instructor is providing these items or is asking students to bring them.